Agari, a firm that offers protection against email-borne threats, has spent the last 10 months analyzing the targets, tactics and identities of 10 separate criminal organizations. All ten organizations concentrate on email scam attacks; and nine of the ten are located in Nigeria. While this does not prove that 90% of email scams come out of Nigeria, it is probably fair to say that Nigeria dominates this vector. The organizations were originally selected via scam emails targeted at Agari customers and blocked by Agari software. But Agari's analysis is far more than just an investigation into known scamware. Chief scientist Markus Jakobsson told SecurityWeek that he and his team developed a method of gaining access to the scammers' own mailboxes, using what he describes as responsible active defense. The responsible element includes gaining FBI 'acquiescence' on the project. It is described as 'active defense' because it falls short of 'hacking back'. "You could describe it," he told SecurityWeek, "as a process of socially engineering the social engineers." During the course of the project using this methodology, he and his team captured 78 criminal email accounts belonging to 10 different criminal organizations and containing 59,652 unique emails. In a report (PDF) published Tuesday, Agari was able to analyze the process and progress of email scams rather than just the content of individual scam emails. Just like cybercriminals globally, the Nigerian scammers are becoming more sophisticated (using, for example, persistent and stealthy malware to penetrate organizations' email accounts), and are beginning to direct their attention against commercial organizations rather than individual computer users. As elsewhere, 'profit' is the motive: business email compromise (BEC) attacks require less individual effort for a much higher return. Agari's research shows that the average BEC incident nets $35,000 for the criminals. 3.97% of people who answer a BEC email become victims -- and 24% of all email scams are now BEC. In June 2017, the FBI reported that the total worldwide dollar loss to BEC scams was in the region of $5.3 billion. BEC works by the scammer masquerading as the company president or CEO, and requesting that Finance should send an urgent payment to a customer or business partner. The figures show that it is remarkably successful. But despite its success and despite the higher returns on effort, it is not the most frequent scam. That remains -- from the same criminal organizations -- the romance scam. This is a primary method, along with work-from-home scams, used to recruit the money mules needed to get money out of the country (asking Finance to wire money direct to Nigeria or China or the Philippines would probably fail at the first hurdle). "Recruiting money mules is a full-time effort for each of the groups we captured. As the scammer groups are typically based overseas, a successful scamming operation is entirely dependent on money transfer techniques that evade suspicion." Typically, a romance scam works by first making contact through a dating website. As soon as possible, the conversation is moved to a separate communications channel, and the scammer starts to ask for small sums of money to help with some contrived hardship. "Once the victim starts complaining about money, offer them a way to get all of their money back by simply cashing a couple of checks and sending part of the money to the scammer via MoneyGram or Western Union." Once this happens, the romance victim becomes susceptible to blackmail and a money mule (or money launderer) has been recruited. Money scammed from other victims is not wired directly abroad, but wired to the local mule's bank account, and from there on to its overseas destination. The details of such scams -- and many more categories are discussed in the Agari report -- are already well-understood. What is new, however, is Agari's ability to monitor the captured criminal email accounts over time and see the scam unfolding; both the scammers' requests and the victims' replies. On several occasions Agari was able to step in and warn the victim. In November 2017, for example, it warned 5 real estate firms that their email had been compromised. In April 2018, "an Agari researcher identified [a] BEC attack and was able to warn the accounts payable team just in time to reverse the wire payment. The response from the victim was a condemnation of the attacker using words too colorful to print." The Agari project is an example of the growing determination of cyber defenders to stop being entirely reactive to threats, and to begin an offensive against the attackers. It is an excellent example of the potential of the concept of active defense. Not only was Agari able to disrupt criminal activity, capture of the criminals' email accounts enabled them to identify many of the individual criminals. "In close partnership with law enforcement, our customers and our partners, "says the report, "Agari will continue to capture and report identity-based attacks and help turn the tide of online crime." Agari raised $22 million Series D funding in May 2016, bringing the total raised by the company to $44.7 million. Cybercriminals have been using a new method to ensure that the URLs included in their phishing emails bypass the Safe Links security feature in Office 365, cloud security company Avanan revealed on Tuesday. Safe Links, offered as part of Microsoft’s Office 365 Advanced Threat Protection (ATP) solution, is designed to protect organizations against malicious links delivered through emails and documents. Safe Links checks the original URL to see if it has been blacklisted (by Microsoft or the ATP customer) or if it points to malware. If a malicious element is detected, the original link is replaced and users are alerted when they click on it. Avanan says cybercriminals have found a simple way to bypass this security feature by using a <base> tag in the HTML header – basically splitting the malicious URL. 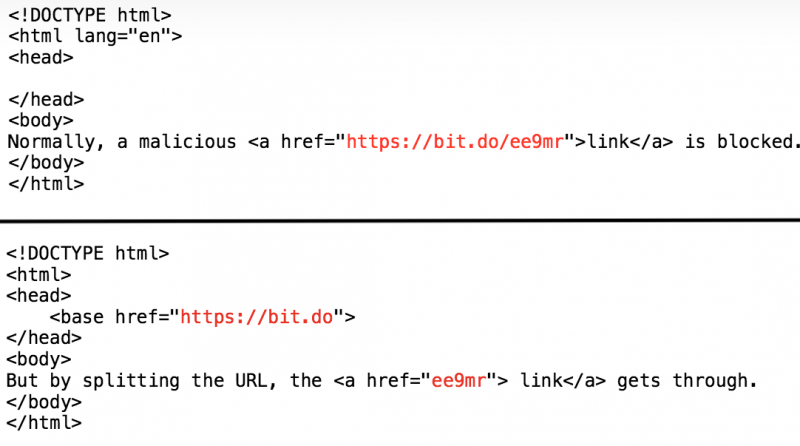 Using this method, Safe Links only checks the base domain and ignores the rest – the link is not replaced and the user is allowed to access the phishing site. “At one time, email clients did not support the <base> tag, so every link need to be an absolute URL. Support for relative URLs in email is a recent development and the behavior is client dependent. Older email clients will ignore the <base> tag, but web-based email clients, recent desktop clients and most mobile apps will now handle the <base> tag and recombine the URL into a clickable link,” Avanan explained. The attack method, which Avanan has dubbed “baseStriker,” works against the Outlook clients, including the web-based, mobile and desktop applications, which support the <base> header tag. Gmail is not impacted and some security solutions, such as the one provided by Mimecast, protect users against these attacks. While Avanan has only seen this method being exploited in phishing attacks, they believe it can also be leveraged to deliver ransomware and other types of malware. Avanan discovered the use of this attack method after seeing that some phishing emails made it past filters included in Microsoft and Proofpoint products. An investigation revealed that the malicious messages that bypassed these filters had been using the <base> tag. “What made this attack interesting was that the URLs that were making it through were already known by the major blacklist databases that Microsoft subscribes to,” Yoav Nathaniel, Avanan research engineer, told SecurityWeek. According to Nathaniel, a majority of the phishing messages observed by Avanan purport to be DocuSign or Office 365 links and they lead to a fake login page. “The FROM address is customized on a per-email basis to look like the email is an internal one. The FROM: takes the form of ‘targetcompany.com <name@realdomain.com>’ so the user will see ‘targetcompany.com’ as the name, often fooling the user into thinking it is an internal email address. The email is coming from a real email account so the sender passes SPF and DKIM,” Nathaniel said. Microsoft has been made aware of these attacks and the company has launched an investigation. This is not the first time researchers have found a way to bypass Safe Links. Both Avanan and others have disclosed several methods in recent months. Cybercriminals are targeting Airbnb users with phishing emails that urge the compliance with the new privacy regulation General Data Protection Regulation (GDPR). The upcoming General Data Protection Regulation (GDPR) privacy laws threaten with severe penalties to demand personal information from Airbnb users. The interest on the subject is very high among professionals and companies operating in various industries, it’s normal that crooks will try to take advantage of this situation. Airbnb, like many other companies, is sending emails to inform users of changes in the privacy law according to the upcoming GDPR. Cybercriminals are targeting Airbnb users demanding personal information and financial data referencing the GDPR. “This update is mandatory because of the new changes in the EU Digital privacy legislation that acts upon United States-based companies, like Airbnb in order to protect European citizens and companies,” reads the spam message according to the Redscan. The extent of the campaign is still unclear, crooks are targeting businesses’ email addresses taken online. The phishing messages pretend to be a GDPR information request sent by Airbnb to hosts of the service. “The irony won’t be lost on anyone that cybercriminals are exploiting the arrival of new data protection regulations to steal people’s data,” Skynews cited Redscan Director of Cybersecurity Mark Nicholls Nicholls as saying. The phishing emails use a simple as effective social engineering trick, the message informs hosts they can’t accept new bookings or contact potential guests until they accept their organizations are not compliance to the GDPR. Malicious email uses a domain that could appear as legitimate, according to Redscan, in this campaign, hackers rather than the legitimate @airbnb.com domain used the @mail.airbnb.work domain. If the victims click the malicious link embedded in the email, they redirected to phishing page designed to request victims both personal and financial information. “Modern phishing campaigns are becoming increasingly difficult to spot and people need to be extra vigilant when opening emails and clicking links, since it’s important to ensure they originate from a trusted source.” said Mark Nicholls, Redscan’s director of cybersecurity. It is important to highlight, that GDPR notifications sent by companies to its customers don’t ask for users’ credentials, so be careful and stay vigilant. The phishing kit is currently being advertised on the Dark Web at $100-$300 and has been designed to target online users looking to shop at popular retailers, in an attempt to steal their personal details and credit card information. Advertised by a certain [A]pache, the kit doesn’t only display a login page with a prompt for personal and financial information. Instead, it incorporates entire replicas of retail sites, Check Point's security researchers have discovered. Through the kit’s backend interface, cybercriminals can create convincing fake retail product pages, in addition to being able to manage their entire phishing campaign. The [A]pache Next Generation Advanced Phishing Kit is mainly targeting users in Brazil with convincing replicas of Walmart, Americanas, Ponto Frio, Casas Bahia, Submarino, Shoptime and Extra. “By preparing a site with discounted products that appear to be sold by a legitimate retailer, the threat actor can then lure victims into making a ‘purchase’, at which point they surrender their personal and financial information,” Check Point notes. Miscreants downloading [A]pache’s multi-functioning phishing kit don’t need advanced technical abilities to get started with their own cyber-attacks. The kit comes with installation instructions that allows any actor to launch a campaign fast. Packing a full suite of tools to carry out an attack, the kit seems aimed at those with a good knowledge of Portuguese, but the security researchers discovered that some U.S. brands were targeted as well. To trick victims, the attackers use domain names similar to those of the legitimate sites. Once the fake domains have been registered, the miscreants deploy the kit to a PHP and MySQL supported web host, and then log in to the admin panel to configure the campaign. Actors can select an email address to receive notifications; to enter the URL of the phishing site; to choose to disable ‘Boleto Bancário’ (and force victims to enter their credit card data); to insert legitimate product URLs from the retailer’s website for automatic import; and to manage the phished victim information. “[A]pache has made a simple user interface within the admin panel where the threat actor can paste the product URL of the legitimate retailer and the kit will automatically import the product information into the phishing page. They can then view their ‘products’ and change their original prices,” Check Point explains. The phishing sites also claim to be offering competitive prices, in an attempt to motivate potential ‘customers’ into clicking on items and proceeding to checkout. However, prices aren’t reduced by much, as that would raise suspicions. Highly valued and desired items are listed first, to entice potential victims. Not only does the fake website look exactly like the target site, but an automated post-code look-up function for added conviction is also included in the phishing kit. Thus, unsuspecting victims would easily reveal their payment details, including the card’s CVV, and the attacker can view the stolen details in the admin panel. The victim is instead notified that the payment process has failed, so as to avoid arising suspicion when the purchased fake products do not arrive. The attackers would often take down the fake sites after successful attacks, to avoid being caught. In one case, the researchers found a custom built ‘error 404’ site in use, which makes reference to a non-existent ‘Blue World Electronicos’ company. An English version of the page was found being used online on a few domains serving PayPal phishing scams. Thus, the researchers discovered that the author of the Brazilian phishing kit appears to be behind kits targeting US victims as well. After finding the handle ‘Douglas Zedn’ in the control panel of the Walmart phishing site, the researchers managed to link it to the individual’s Steam account and then to their Twitter account. “With some reports claiming that 91% of cyberattacks and data breaches begin with a phishing email, phishing remains a constant threat for stealing financial information, intellectual property, and even interfering with elections. For this reason, consumers and businesses alike must ensure they have the latest protections for safeguarding against such threats,” Check Point concludes. Experts at FireEye uncovered a new massive phishing campaign conducted by TEMP.Zagros group targeting Asia and Middle East regions from January 2018 to March 2018. Iranian hackers are one of the most active in this period, researchers at FireEye uncovered a new massive phishing campaign targeting Asia and Middle East regions from January 2018 to March 2018. “We observed attackers leveraging the latest code execution and persistence techniques to distribute malicious macro-based documents to individuals in Asia and the Middle East. We attribute this activity to TEMP.Zagros (reported by Palo Alto Networks and Trend Micro as MuddyWater), an Iran-nexus actor that has been active since at least May 2017.” reads the analysis published by the experts at FireEye. The TEMP.Zagros was first spotted by researchers at PaloAlto Networks in 2017, the hackers targeted various industries in several countries with spear-phishing messages. “We discovered a new campaign targeting organizations in Turkey, Pakistan and Tajikistan that has some similarities with an earlier campaign named MuddyWater, which hit various industries in several countries, primarily in the Middle East and Central Asia.” states the analysis published by Trend Micro. According to FireEye report, TEMP.Zagros attackers are adopting a new backdoor dubbed POWERSTATS for backdoors and the reuse of a known technique for lateral movements. Each of these macro-based documents used similar techniques for code execution, persistence, and communication with the command and control (C2) server. “In this campaign, the threat actor’s tactics, techniques and procedures (TTPs) shifted after about a month, as did their targets.” continues FireEye. The campaign started on Jan. 23 involved a macro-based document that dropped a VBS file and an INI file containing a Base64 encoded PowerShell command. The Base64 encoded PowerShell command will be decoded and executed by PowerShell using the command line generated by the VBS file on execution using WScript.exe. Attackers used a differed VBS script for each sample, employing different levels of obfuscation and different ways of invoking the next stage of the process tree. Starting from Feb. 27, 2018, hackers used a new variant of the macro that does not use VBS for PowerShell code execution. The new variant uses a new code execution techniques leveraging INF and SCT files. Researchers at FireEye also found Chinese strings in the malicious code used by TEMP.Zagros that were left as false flags to make hard the attribution. “During analysis, we observed a code section where a message written in Chinese and hard coded in the script will be printed in the case of an error while connecting to the C2 server:” states FireEye. Indicators of compromise (IoCs) and other info are included in the report published by FireEye. Cofense LogoThe company says it currently has more than 1700 customers globally and that its PhishMe Reporter is installed on more 10 million endpoints.